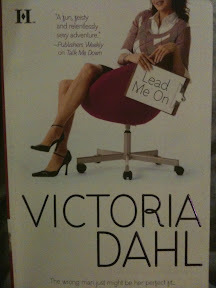 My first read of 2010 was Victoria Dahl's "Lead Me On", her follow up to "Start Me Up". It took me a while to find it. B&N didn't have any copies available on the two occasions I looked for it. I ended up picking up a copy at Borders. "Lead Me On" was a cute, easy read (My take: ). Jane Morgan is the prim and proper office manager for an architect. However, it's a sham. After a wild childhood, she changed her name and looks, and vowed to live a quiet, normal life. When she meets Chase, a tattooed, steel-toed wearing demolitionist, she convinces herself that she deserves a fling after maintaining her good girl image for a decade. But Jane soon discovers that what she thinks is wrong for her may be exactly what she needs and that looks are deceiving.